The area of 30A and Destin on the Emerald Coast has something for everyone! 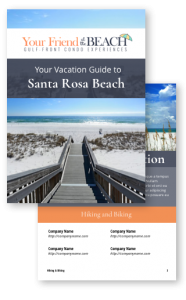 Whether you are traveling with family, friends, or planning a romantic couple’s getaway, we guarantee you won’t run out of things to do when you download our 30A Vacation guide. From countless beautiful beaches, restaurants, shopping, entertainment, and more. You will fall in love with the Emerald Coast and all it has to offer! Fill out the form below to unlock your 30A Vacation Guide to receive all the insider information and travel secrets to craft your Emerald Coast vacation in no time. Our beautiful white-sandy beaches, fun activities, wonderful dining, and more are all at your fingertips! Complete this Form to Receive Your Free Vacation Guide! Simply enter the password provided in your email here to see all there is to do in beautiful 30A and the surrounding area. If you don’t have a password yet, please request your Vacation Guide above!